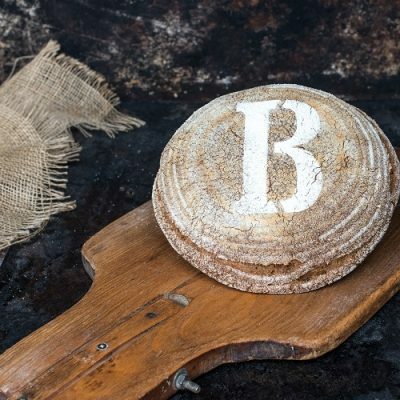 Using stone milled flour, our Stoneground Wholemeal Boule has a distinctive taste and is very good for you given that it contains the natural goodness from essential fibre, minerals and fats. The stone ground process for creating flour also allows for larger bran particles, leading to a denser and moister crumb, and a delicious bread that can be used for any meal. Organic Wholemeal Wheat Flour, Water, Fortified Wheat Flour (Wheat Flour, Iron, Niacin, Thiamin, Calcium Carbonate), Rice Flour, Rye Flour, Salt, Acidifier: Acetic Acid, Ascorbic Acid; Roasted Malted Wheat Flour.